New Algerian Prime Minister Noureddine Bedoui said on Thursday that he will set up a technocratic interim government days after longtime President Abdelaziz Bouteflika opted out of the presidential race in the face of mass protests. Bedoui, who was appointed prime minster this week after his predecessor Ahmed Ouyahia resigned in the wake of the protests, said his new cabinet would be formed early next week and will include young Algerians, who have been staging mass protests to push for quick political changes. Bouteflika, the 82-year-old wheelchair bound leader, also decided to delay the long-awaited election scheduled to be held in April, sparking countrywide protests. Speaking at a press briefing in the capital, Algiers, the new prime minister said postponing presidential election came in response to ”people’s will” and an independent commission will oversee Algeria presidential election, for which he did not specify a date. Bedoui called for establishing new state of law and announced that a national conference for political reforms will start work after government formation “to represent young Algerians including young women”. He added that the new government to be formed would be in charge for a “short period of time” and would support the work of a national conference for a political transition. The prime minister urged the opposition to accept dialogue, but lawyers and activists behind the protests are in no mood to compromise and say they will not negotiate, at least for now. “What we have to understand is that the government is trying to accelerate the pace of negotiations in order to avoid mass protests on Friday,” Amina Afaf Chaieb, an activist at Ibtykar Citizen Movement, told Al Jazeera from Paris on Thursday. 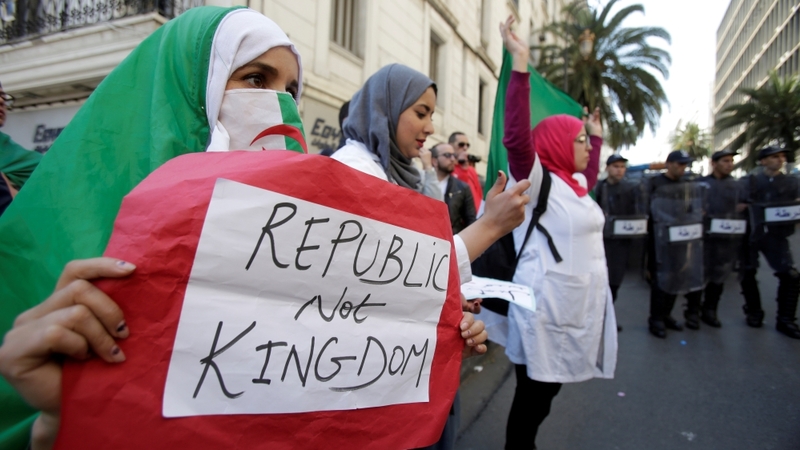 Bouteflika has faced three weeks of mass protests against his planned fifth-term run. He relented on Monday by announcing he would not be running again but said the presidential elections scheduled for April 18 will be postponed indefinitely. The ailing president, 82, made the unexpected decision in a letter to the Algerian people released on state-owned agency APS, a day after returning from a two-week stay at Geneva University Hospital for “routine medical tests”. According to Bouteflika’s message and prime minister-designate’s statements, an inclusive and independent conference will oversee the transition of power, drafting new constitutional law and setting the date for new presidential elections. Bouteflika, who has been in power for 20 years and has rarely appeared in public since a stroke in 2013, has promised to work for a new era that would cater to all Algerians. His offer came after tens of thousands of Algerians staged weeks of protests demanding an overhaul of a stagnant political system dominated by veterans of the 1954-62 war of independence. What can an investigation into Khashoggi’s murder achieve?